There's no such thing as a Morton Arboretum wedding DJ. If you're been engaged a little while, you've no doubt discovered this already: Your DJ (like your photographer, your florist, and whoever actually says "have you the ring?") won't be an employee of the venue you choose for your wedding. You'll vet and hire the DJ yourself. Every professional DJ visits literally dozens of different wedding venues every year. Want a little insight into how we think? Backthird DJs are at the Arboretum several times a month for weddings and events - we even hold mock Arboretum weddings when we examine and certify our new DJs after they've been trained. 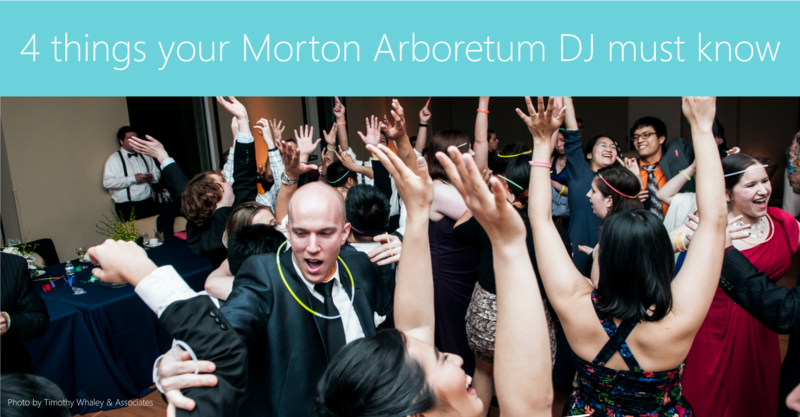 Read on to learn what we always tell our new team members about Morton Arboretum wedding DJs work - or take a look at our most popular Arboretum wedding plans and prices right here. 1. Plan sound equipment for multiple spaces. Plenty of banquet halls in Chicago park you in a big room at 6, open the bar and tell you to settle in until midnight. The Arboretum isn't one of them! You're literally getting married in a tree museum - so unless you're planning a winter wedding, you're probably hoping to be outdoors for at least a little of that time. In a wedding at Morton Arboretum, it's not unusual to transition from your ceremony on the lawn, to a patio for drinks, to one room for dinner and on to a second room for dancing. If your DJ doesn't plan for those transitions with plenty of audio gear, you're going to experience dead air for at least a portion of the night. 2. Plan an agenda for multiple spaces. Changing locations throughout your ceremony and reception is a blast - it keeps guests on their toes and keeps things feeling new throughout the celebration. That is, as long as your wedding DJ helped you plan an agenda that fits with these changes. There are lots of ways to skin a cat, so your DJ's suggestions are just that. But it's important to consider physical space when writing your agenda. 3. Have a transition plan. Your DJ doesn't just help write your agenda - she also helps you sell it. That means a Morton Arboretum wedding DJ has to be a competent MC, letting guests know what's going to happen next and guiding them in a way that's clear without feeling forced. There are as many ways to pull this off as there are DJs and wedding couples. Some Backthird DJs have been known to literally dance guests through the doorway from a Ginkgo Room dinner into Orientation Hall for dancing. For others, that would be utterly out of character - but they might have no problem standing YOU in the doorway and saying "please follow the wedding couple to the dance floor." Your DJ's transition approach should suit her own personality - and your own style. A lot of the Arboretum's event spaces are outdoors, which means that weather is always a factor. Maybe getting married on the lawn sounded great two months ago - but now it's rained for weeks and the ground is too soft to be high-heel friendly. Arboretum staff have always got a good Plan B up their collective sleeve - and your DJ may be finding out about it a few hours before the party starts. He should be flexible enough to keep up, adapting the spirit of your plans to the reality of every situation. With the right sound gear, a strong agenda and a solid transition plan, he will be.